Lips are having a mega moment this year— like they do every year. If you, like us, need to polish up on your make up 101 and learn how to nail a long lasting pout, which will actually stay on all day, you’ve come to the right place. 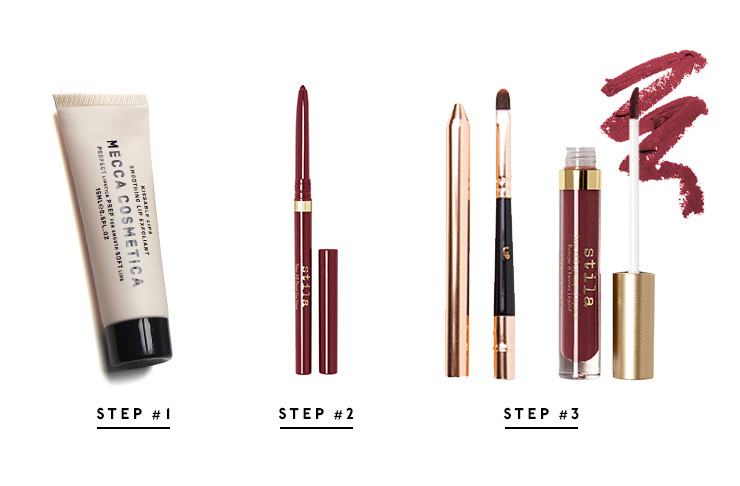 Thanks to Lenita Seker at Mecca Cosmetica, we’ve gone back to basics in the form of a super simple, step-by-step pout guide. First of all, make sure you start with a lip scrub like the Mecca Cosmetica Kissable Lips. This is an absolute must as it will prep the lips for a seamless application (not to mention make them oh-so soft and as smooth as a baby’s bottom). For a bold lip and full finish (think Kylie Jenner without the injections), the key is to line the lips with a similar colour. Stila’s Stay All Day Lip Liner glides on with ease, so start by outlining the lip shape then lightly fill the lips in through the centre. The secret to a long lasting pout all comes down to a lip brush. Starting at the centre of the lips, use a brush like Mecca Cosmetica’s Retractable Lip Brush and coat the lips with a liquid lipstick (we LOVE Stila Stay All Day Liquid Lipstick), working your way towards the liner. Our work here is done. Now it’s up to you to be that easy, breezy, beautiful cover girl you’ve always wanted to be. Now that you've perfected your pout, how about that perfect summer body.